Dozens of people were killed in Turkish bombardments in Syria on Sunday as Ankara ramped up its unprecedented offensive against the Islamic State group and Kurdish militants. Ankara said it had killed 25 Kurdish "terrorists" and insisted the army was doing everything possible to avoid civilian casualties. But the Britain-based Syrian Observatory for Human Rights said at least 40 civilians were killed in Turkish shelling and air strikes on two areas held by pro-Kurdish forces in northern Syria, the first report of significant civilian casualties in Turkey's operation. The bombardments came after Ankara suffered its first military fatality in the two-pronged offensive against IS and the Syrian Kurdish People's Protection Units (YPG) militia. 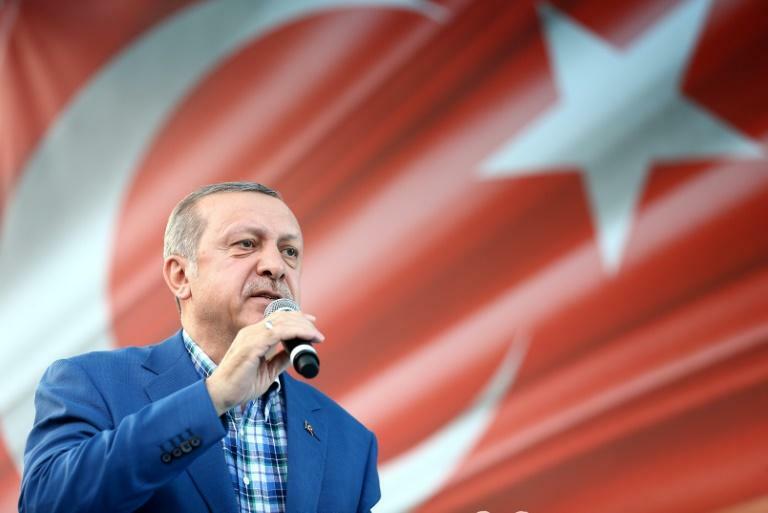 Addressing a rally in the southern city of Gaziantep, President Recep Tayyip Erdogan vowed to combat the jihadists and the US-backed Kurdish fighters "with the same determination." "We will make any kind of contribution to the work to clear Daesh (IS) from Syria," Erdogan told thousands of flag-waving supporters in the city where a suicide bomber suspected of IS links blew himself up at a wedding party last weekend. Regarding "the PYD (Democratic Union Party) terror group in Syria, we have just the same determination," Erdogan said, referring to the main pro-Kurdish party in northern Syria and its YPG militia. 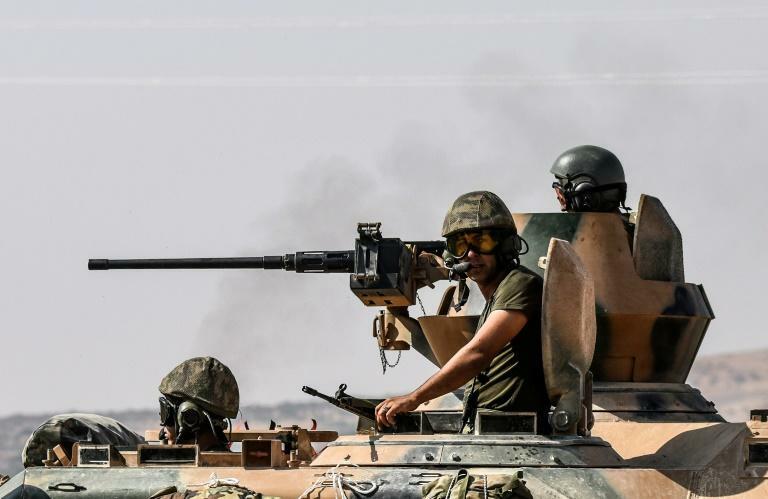 On Sunday, Turkish forces ramped up their offensive against pro-Kurdish forces near a town wrested back from IS this week by Turkish-backed Arab rebels. According to the Observatory, Turkish artillery fire and air strikes on Jeb el-Kussa village killed at least 20 civilians and wounded 50 others. Another 20 were killed and 25 wounded in air strikes near the town of Al-Amarneh, it said. The monitor also said at least four Kurdish fighters were killed and 15 wounded in the two areas. Turkey said the dead were 25 "terrorists" from the YPG and the outlawed Kurdistan Workers' Party (PKK), state-run Anadolu news agency said. "All possible measures are being taken to prevent harm to the civilian population living in the area," the army said, quoted by Anadolu. Sunday's operations took Turkey deeper inside Syria, into an area where the Kurdish forces that control much of the border had begun to expand. Jeb el-Kussa is located 14 kilometres (almost nine miles) south of Jarabulus, the IS border stronghold which Turkish-backed Arab rebels captured on the first day of the incursion. The rebels say they have captured at least nine towns and villages, including Jarabulus, from IS and Kurdish forces since Wednesday. In a statement Saturday, Kurdish forces accused Ankara of seeking to "expand its occupation" inside Syria. The latest fighting is likely to raise deep concerns with Washington, Turkey's NATO ally which supports the YPG as an effective adversary of IS. But Turkey considers the YPG a "terrorist" group and vehemently opposes its attempts to create a contiguous autonomous zone along its border, fearing it could strengthen the Kurdish rebels fighting the state in southeast Turkey. Ankara says the YPG has broken a promise made to the US to go back across the Euphrates River after advancing westwards earlier this month. On Sunday, the first Turkish casualty in the operation was flown home from Gaziantep for burial in his home province of Duzce on the Black Sea. Erdogan also met relatives of the victims of the August 20 suicide bombing in Gaziantep, which hit a Kurdish wedding, reaffirming his earlier claim that the bomber was a 14-year-old boy. Ankara's military intervention has added another dimension to Syria's complex multi-front war, a devastating conflict that has killed more than 290,000 people and forced millions from their homes since March 2011. The Observatory said government forces on Sunday resumed shelling and air strikes on the rebel-held Waer district of Homs city, killing three people and wounding another 20. Much of the heaviest fighting this summer has focused on the second city of Aleppo, which is roughly divided between rebel forces and President Bashar al-Assad's troops. Global powers have been pushing for 48-hour humanitarian ceasefires in the embattled city. Russia, which backs Assad, has endorsed the proposal. But some rebel groups have rejected the plan. Meanwhile, French Foreign Minister Jean-Marc Ayrault on Sunday said it was crucial to condemn Damascus' use of chemical weapons in Syria ahead of a crunch UN Security Council meeting on the issue. "I cannot see the reasons or arguments for not condemning the use of chemical weapons," he said in remarks apparently directed at Russia.